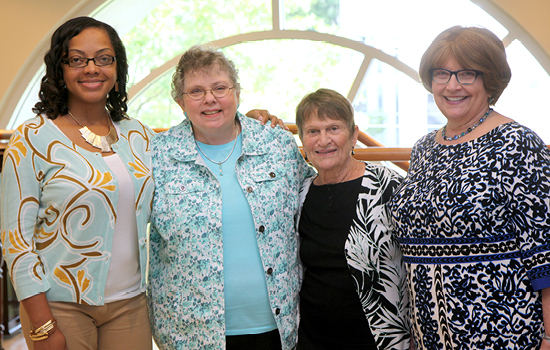 NAA award winners: Joanne Butler Parks, Jacqueline Zalumas, Anne Sayre, and Ann Nix at the School of Nursing. For a decade, Jacqueline Zalumas 73MN 89PhD led the Corrections Technical Assistance and Training Project with the Southeast AIDS Training and Education Center in Emory School of Medicine. Through a series of federal grants, Zalumas evaluated models of training and provided technical assistance and training on HIV and other infectious diseases to medical, law enforcement, and transitional care staff in adult prisons and jails, juvenile detention facilities, and the community. A professor emeritus with the School of Medicine, Zalumas served on the nursing faculty at Emory, Mercer University, and North Georgia College and as a nurse at Emory University Hospital. She is a contributor to the Georgia Public Health Oral History Collection in the Manuscript, Archives, and Rare Book Library in Woodruff Library and wrote the book Caring in Crisis: An Oral History of Critical Care Nursing (U. Pennsylvania Press, 1995). Ann Nix 77N 07MN has been a nurse and nursing leader at Atlanta's Northside Hospital for nearly four decades. Currently, as manager of quality and education for surgical services, Nix oversees clinical outcomes for surgical patients at the three hospitals within the Northside Hospital Health System. She also practices at Northside Anesthesiology Consultants. For her accomplishments, Nix was named the March of Dimes Nurse of the Year for Surgical Services in 2015. She is a member of the American Academy of Nurse Practitioners, the American Society for Pain Management Nursing, and the Association of Perioperative Registered Nurses. Anne Sayre 57N is a retired Presbyterian minister dedicated to serving people in need. She has helped displaced steel workers in Pittsburgh and set up medical clinics in the Dominican Republic. In Guatemala, Sayre worked with church and government leaders to establish a birthing center in the town of Cahabon to reduce the dramatically high rates of maternal and infant mortality in the region. The center was named the Casa Materna Ana Sayre (the Anne Sayre Birthing Clinic) in her honor. It is now the site of a project to train nurse-midwifery students from Emory. Joanne Butler Parks 13N has served as a nurse with the Atlanta VA Medical Center and currently practices with Gentiva Health Services to provide home health care and with the Fulton County Health Department, where she has fostered best practices to improve quality health care and access. An aspiring leader, Parks serves on the advisory board for the School of Nursing/VA Nursing Academic Partnership and on the Georgia Nurses Association board of directors as director of staff nurses. She is working toward a master's degree in psychiatric/mental health nursing and a DNP at the University of Alabama at Birmingham.